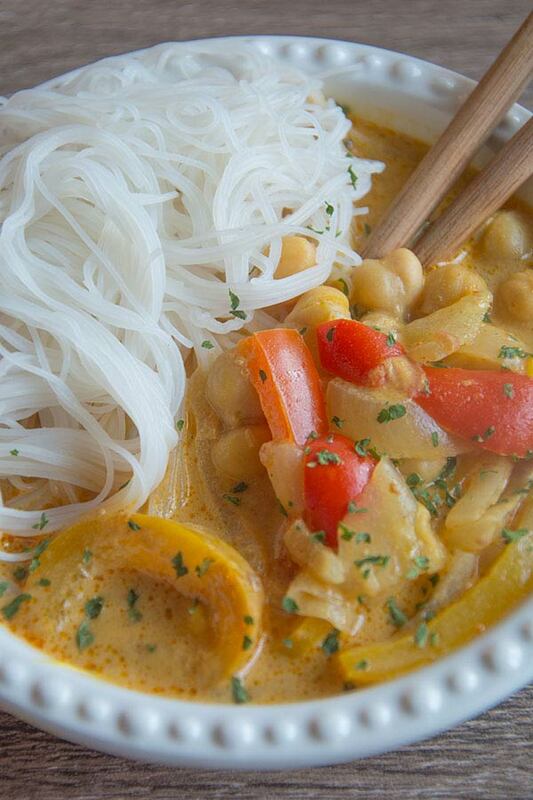 This Thai Red Curry Coconut Soup is an all-time favourite creations! We hope that got your attention, because it’s true! It’s the BOMB and so easy to make! This soup was Sigourney’s brainchild on our drive home from the most epic girls camping weekend. 6 girls, 1 tent, wine, music, amazing food and so much laughter! On our drive home she got the most intense craving for some sort of Thai soup (very unlike Sigourney) and as soon as she got home took off to the store to buy some. Her mom called she was at the grocery store and asked what she was buying. When she said all she wanted was Thai Curry soup, but they only had alphabet soup her mom said, “Alphabet Soup!! Sigourney. Come on! 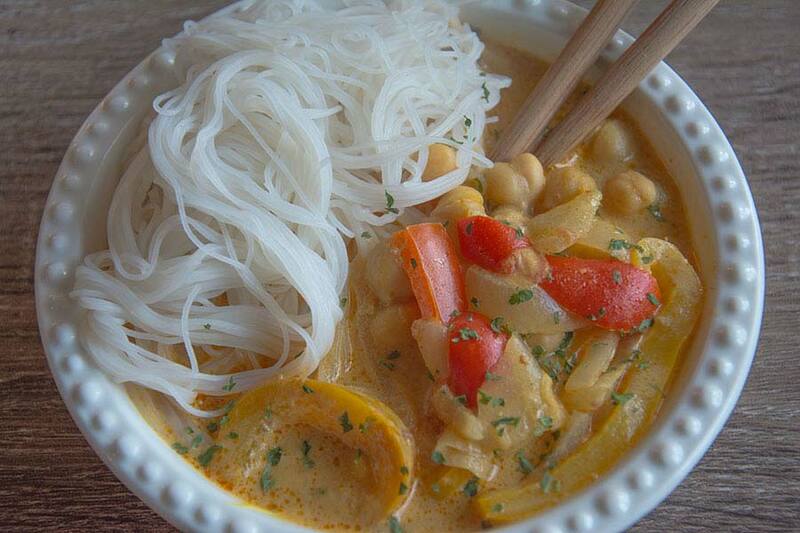 You can make a Thai Curry soup in no time!”. She walked her through the ingredients and then she was off! As an aside, Mom’s really are the best sense of reason when you really need it. She was so right! And thus our Thai Red Curry Coconut Soup was born. The bigger win? It only takes 30 minutes to make! Thanks mom! This soup does have a slight spice to it, so if you’re sensitive to spice don’t add the Sambal Oelek sauce. We love spice so we top ours with Sriracha for an even bigger kick. The craving that created this recipe wanted noodles, but it could definitely be served with rice instead. It’s the perfect weeknight meal. There is very little prep, very little cook time and a lot of flavour. We hope you enjoy this meal as much as we do! When Brigette had this for the first time she was in loveeeee! And she’s a tough soup critic so that says a lot!! 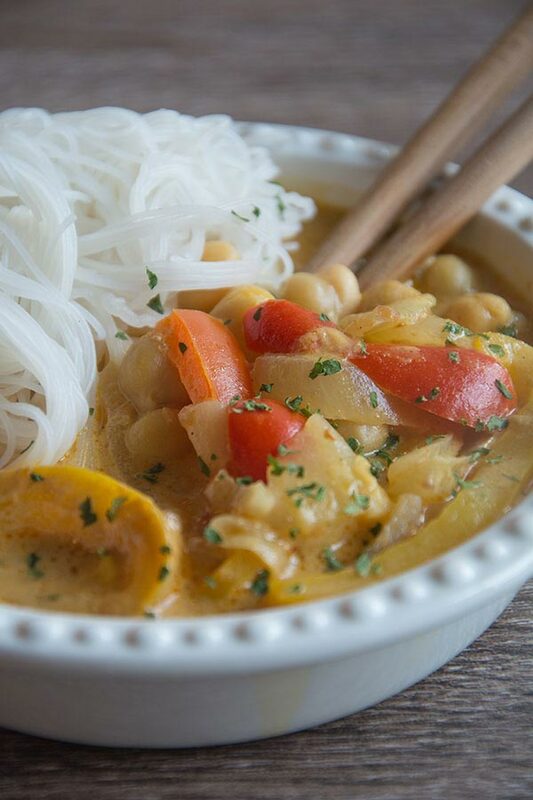 Love lots of veggies and noodles in your soup? Then you’ll love our Vegan Ramen Bowls and Sweet and Sour Soup! To a large pot over medium heat add the olive oil, red bell pepper, yellow bell pepper and onion. Sauté for 5 minutes until the veggies start to soften slightly. Next add in the garlic and ginger, sautéing for an additional minute, until fragrant. Add in the curry powder, red curry paste, coconut milk, almond milk, chickpeas and salt. Mix well and bring to a simmer. Reduce heat to a low, cover and let cook for 20 minutes, mixing occasionally. Meanwhile cook the noodles according to the package. To serve add a serving of noodles to the bowl and 2 ladles of the soup. If desired chopped with chopped peanuts and Sriracha to serve.